ENO1 Assay Kit (alpha Enolase, Human) ab117994 is used to determine enolase 1 (ENO1) activity in a sample. The native enzyme is immunocaptured within the wells of the microplate; this removes all other enzymes. The enolase activity is determined via a coupled reaction to the consumption of NADH in an assay buffer. Scheme of reactions used in this kit. 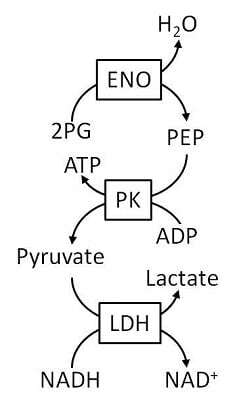 Abbreviations are as follows: enolase (ENO), 2-phospho-D-glycerate (2PG), phosphoenolpyruvate (PEP), pyruvate kinase (PK), lactate dehydrogenase (LDH). Immunofluorescent detection of ENO1 in cytosol in HeLa cells using ab112994. Example of dilution series prepared from HepG2 cells extract. Analysis of recombinant ENO1 (ab89248) and the neuron-specific recombinant ENO2 (ab78797), each at 2000 ng/mL. The relative ENO activity was determined from HepG2 standard curve as described in the protocol. 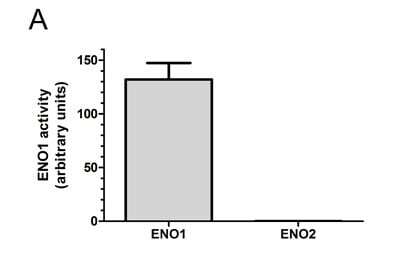 The data show that the activity of the neuron-specific ENO2 can’t be detected. Can I have a more detailed protocol regarding how to do the data analysis for a kinetic assay? Also, please provide details as to the proper use of the LDH control in the assay. Please note that the LDH is simply added to the rehydrated 'Reagent Mix', along with PK, to produce the 1x Acitvity Solution. 1. Since consumed NADH is measured, the delta mOD/min is a negative number. So for convenience, convert the collected data to positive numbers by multiplying them by -1. 2. Subtract “zero standard” – see step 8.3 - from all other readings. 3. Construct standard curve of the reference sample dilution. As recommended, the standard Eno1 protein (ab89248) should be used as a reference sample, but other samples may be used as reference sample. Plot the protein concentration of the standard on the X axis and the corresponding zero standard-subtracted mOD/min values on Y axis as in Figure 2.. Construct a best fit curve through the datapoints. 4 parameter logistic (4PL) algoritm provides usually the best fit, though other algoritms may be used. 4. Relative activity of the unknown samples, e.g cell extract is then interpolated from the standard curve by using zero standard- subtracted mOD/min values of unknown samples as parameters on Y axis and from the standard curve interpolating the relative activities on the X axis. 5. As written in the protocol, the relative activity is the amount of reference sample required to generate the same amount of activity as the unknown sample. 6. Divide the relative activity of unknown samples by the total protein of the sample. This will allow to compare unknown samples one to another. This step is important only if unknown samples of different protein concentrations were analyzed. Welche Platte wird in ab117994 verwendet? Bitte entschuldigen Sie die verspätete Antwort. MitoSciences sitzt an der Westküste in den USA und durch die Zeitverschiebung habe ich erst jetzt eine Antwort erhalten. Ich freue mich Ihnen bestätigen zu können, dass in Kit ab117994 Nunc Platten (cat # 445101) namens C8 Maxisorp Nunc Immuno Module verwendet werden. Ich hoffe, diese Information ist hilfreich und dass Ihr Analyzer diese Sorte Platten erkennt.